Actually, Pippi Mae Hudson… the tri-pawed pit bull story! When we adopted a red nose pit bull named Pippi in early 2007, we had no idea if she would be able to physically support herself with only three legs. As many of you know, she not only gets around with ease, but, has become quite famous as the spokes-dog for the Hudson Law Office! Everywhere we went, people wanted to know her story. They recognized her from several of the Hudson Law Office commercials. Pippi even had her own Facebook page, so people could follow her activities! Every weekend, Pippi went out to meet the public. She loved going to Cha Cha Coconuts on St. Armands Circle, where they always greeted her with a bowl of water and sweet potato fries. Almost every child who came past asked about this friendly little dog and wondered what happen to her. Pippi usually responded with a “Pippi facial,” licks from the face to the toes that usually created great laughter. We first heard about Pippi when Dr. Laurie Walmsley asked us if we wanted to adopt another dog. We already had two rescued dogs… a black Lab mix named Lucky and a pit bull-boxer mix named Rosie. Pippi had been brought to the Ashton Animal Clinic by a couple of students at New College. She wasn't in good shape… her ears were torn up and she had a nasty gash across her throat. Worst of all, her right shoulder was dislocated. From her condition and the part of town where she was found, it appeared that she was a victim of the odious practice of dog fighting. Due to the delay in getting medical treatment, her front right leg could not be saved. Thanks to Dr. Laurie, Pippi had already begun her recovery, and after six weeks at the Ashton Animal Clinic, was ready to be adopted. As we mentioned, we already had a houseful of pets. Besides Lucky and Rosie, there was our oldest pet, a very regal cat named Potter, who had been part of the family since 1998. Potter had been the smallest of a litter of cats in the family of a girl from my daughter's school. He had some health problems, but they didn't stop him from growing into a 20-pound cat… the Alpha creature, even in a household with two pit bulls! Nobody messes with Potter. The other dogs have their own stories. We adopted Lucky and Rosie in 2005 and 2006. Lucky was from the Manatee County Humane Society, where he had stayed for eight months. Dr. Walmsley patched up Rosie after having her pelvis shattered by a car when she was a stray. We had no idea that Lucky and Rosie were about to get a baby sister when, in March, 2007, Dr. Walmsley told us about this “really cute pit bull” whose right front leg had just been amputated. At first, we thought it was out of the question. A third dog? How could we do it? But our daughter Sarah insisted that we couldn't take a chance that this little creature might be euthanized. So, after initially declining to adopt Pippi, we went back and saw her again. Nobody could say “no” to Pippi twice. She came home with us, and the rest is history. We discovered that Pippi had a personality like Tigger… she bounces off the walls, but you gotta love her. She quickly became a part of the family. Every morning after breakfast, she chased her brother and sister around the house and out into the yard. When my mother was ill in June, 2008, she was hospitalized at HealthSouth Rehabilitation Hospital in Sarasota for about a week. At HealthSouth, they encourage the families of their patients to bring pets to visit during their hospital stays. When Pippi went to visit Ellen Hudson, she was “discovered” by the HealthSouth staff. Everyone who saw Pippi remarked about how she would lift the spirits of someone who had just lost a limb. On the day Ellen Hudson was discharged, one of the RNs at HealthSouth approached me in the hallway and remarked about how everyone seemed to love Pippi. She observed that HealthSouth is a rehabilitation hospital, and that it has a lot of patients who are dealing with amputations. Having been brought down a peg, I thought about it, and decided that Pippi was a gift who should be shared. And with that, Pippi began a new chapter in her life as a volunteer at HealthSouth, visiting the patients every weekend. And you should see how a visit from Pippi used to put a smile on the patients' faces. Pippi was a constant reminder of the devastation that can be caused by an injury, and the fact that afterwards, life does get better. Sadly, Pippi's big sister Rosie died on New Years Eve, 2014. Her life wasn't long, but we were happy to have given her some good years after a rocky start. The really good news is that we adopted another stray, Sophie, on April 1, 2014 to bring our complement of three rescue dogs back to full strength. Sophie was one of over 200 dogs, along with cats and horses, who were seized from a hoarder in Manatee County in February, 2014. Even though she is only 4 or 5, Sophie has had a litter or two, and her tongue hangs out where she's missing teeth due to bad healthcare. Sophie is happy to have a forever home, and is slowly learning to trust her new siblings and to play with them. Sadly, only about six weeks after Sophie came home with us, Pippi left us. This is the thing about being a dog person. You know you're usually going to outlive them. True to form, we looked for a good candidate to fill the roster spot left by Pippi's passing. And one afternoon in June of 2014, Lucy came home with us from the Humane Society of Sarasota County. Lucy is a little dog, almost exactly the same size as Sophie. They enjoy chasing each other around the house. 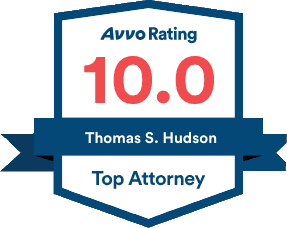 The Hudson Law Office, committed to our clients and the community. Contact us at (941) 358-5400.